Prolific American horror, fantasy and Science Fiction author Howard Phillips Lovecraft tragically died on March 15, 1937, in Providence. He was born August 20, 1890, known as H. P. Lovecraft he wrote mostly horror, fantasy, poetry and science fiction, especially the subgenre known as weird fiction. Lovecraft’s guiding aesthetic and philosophical principle was what he termed “cosmicism” or “cosmic horror”, the idea that life is incomprehensible to human minds and that the universe is fundamentally inimical to the interests of humankind. As such, his stories express a profound indifference to human beliefs and affairs. Lovecraft is the originator of the Cthulhu Mythos story cycle and the Necronomicon, a fictional magical textbook of rites and forbidden lore. Some of Lovecraft’s work was inspired by his own nightmares. His interest started from his childhood days when his grandfather would tell him Gothic horror stories. Lovecraft’s biggest influence was Edgar Allan Poe and forbidden knowledge Is often a central theme in many of Lovecraft’s works.Many of his characters are driven by curiosity or scientific endeavor, and in many of his stories the knowledge they uncover proves Promethean in nature, either filling the seeker with regret for what they have learned, destroying them psychically, or completely destroying the person who holds the knowledge. Some critics argue that this theme is a reflection of Lovecraft’s contempt of the world around him, causing him to search inwardly for knowledge and inspiration. The beings of Lovecraft’s mythos often have human (or mostly human) servants; Cthulhu, for instance, is worshiped under various names by cults amongst both the Eskimos of Greenlandand voodoo circles of Louisiana, and in many other parts of the world. These worshippers served as inspiration for Lovecraft. Many beings of the Mythos were too powerful to be defeated by human opponents, and so horrific that direct knowledge of them meant insanity for the victim. When dealing with such beings, Lovecraft needed a way to provide exposition and build tension without bringing the story to a premature end. Human followers gave him a way to reveal information about their “gods” in a diluted form, and also made it possible for his protagonists to win paltry victories. 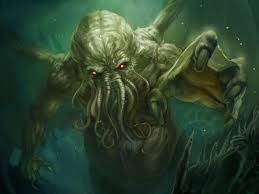 Lovecraft, like his contemporaries, envisioned “savages” as closer to supernatural knowledge unknown to civilized man. Another recurring theme in Lovecraft’s stories is the idea that descendants in a bloodline can never escape the stain of crimes committed by their forebears, at least if the crimes are atrocious enough. Descendants may be very far removed, both in place and in time (and, indeed, in culpability), from the act itself, and yet, they may be haunted by the revenant past, e.g. “The Rats in the Walls”, “The Lurking Fear”, “Arthur Jermyn”, “The Alchemist”, “The Shadow Over Innsmouth”, “The Doom that Came to Sarnath” and The Case of Charles Dexter Ward. Often in Lovecraft’s works the protagonist is not in control of his own actions, or finds it impossible to change course. Many of his characters would be free from danger if they simply managed to run away; but are being prevented by some outside force, such as in “The Colour Out of Space” and “The Dreams in the Witch House”. Often his characters are subject to a compulsive influence from powerful malevolent or indifferent beings. As with the inevitability of one’s ancestry, eventually even running away, or death itself, provides no safety (“The Thing on the Doorstep”, “The Outsider”, The Case of Charles Dexter Ward, etc.). In some cases, humanity itself is doomed and no escape is possible (“The Shadow Out of Time”). Lovecraft was also familiar with the work of the German conservative-revolutionary theorist Oswald Spengler, whose pessimistic thesis of the decadence of the modern West formed a crucial element in Lovecraft’s overall anti-modern worldview. Spenglerian imagery of cyclical decay is present in At the Mountains of Madness. The book H. P. Lovecraft: The Decline of the West, places Spengler at the center of his discussion of Lovecraft’s political and philosophical ideas. H. P. Lovecraft’s writing, particularly the so-called Cthulhu Mythos, has influenced fiction authors including modern horror and fantasy writers such as Stephen King, Ramsey Campbell, Bentley Little, Joe R. Lansdale, Alan Moore, Junji Ito, F. Paul Wilson, Brian Lumley, Caitlín R. Kiernan, and Neil Gaiman, have cited Lovecraft as one of their primary influences. Beyond direct adaptation, Lovecraft and his stories have had a profound impact on popular culture. Some influence was direct, as he was a friend, inspiration, and correspondent to many of his contemporaries, such as August Derleth, Robert E. Howard, Robert Bloch and Fritz Leiber. Many later figures were influenced by Lovecraft’s works, including author and artist Clive Barker, prolific horror writer Stephen King, comics writers Alan Moore and Mike Mignola, film directors John Carpenter, Stuart Gordon, Guillermo Del Toro and artist H. R. Giger. Japan has also been significantly inspired and terrified by Lovecraft’s creations and thus even entered the manga and anime media. Chiaki J. Konaka is an acknowledged Lovecraft disciple and has participated in Cthulhu Mythos, expanding several Japanese versions. Anime scriptwriter Cascade also tends to add horror elements and is credited for spreading the popularity of Lovecraft among anime base. Manga artist Junji Ito is also inspired by Lovecraft. Although Lovecraft’s readership was limited during his lifetime, his reputation has grown over the decades, and he is now regarded as one of the most influential horror writers of the 20th century. According to Joyce Carol Oates, an award-winning author, Lovecraft—as with Edgar Allan Poe in the 19th century—has exerted “an incalculable influence on succeeding generations of writers of horror fiction”. Science fiction and fantasy authorStephen King called Lovecraft “the twentieth century’s greatest practitioner of the classic horror tale. King has made it clear in his non-fiction book danse Macabre that Lovecraft was responsible for King’s own fascination with horror and the macabre, and was the single largest figure to influence his fiction writing. Sadly though in 1936, Lovecraft was diagnosed with cancer of the small intestine, and as a result he suffered from malnutrition and lived in constant pain until his death. However Lovecraft’s legacy lives on and his stories have been adapted into plays, films and games, such as Call of Cthulhu: Dark Corners of the Earth and id Software’s Quake. The International Day Against Police Brutality takes place annually on March 15th . Police brutality is one of several forms of police misconduct which involves undue violence by police members and is considered a violation of Civilian Rights. Widespread police brutality exists in many countries and territories, even those that prosecute it. Although illegal, it can be performed under the color of law. For instance Many have been viciously beaten by police in Bangladesh. Various protesters were beaten with bats and sticks while protesting to insult of Islam. Recently, a young man named Shamim Reja was killed by police in Sonargaon police station. The victim’s father claimed that his son was brutally tortured in the police station as the police wanted 6 lakh taka (BDT 600,000). Police investigated this and found the officer in charge Arup Torofar and SI Paltu Ghush and ASP Uttam Prashad guilty as charged. The Police in Brazil also have a history of violence against the lower classes, which dates back to the nineteenth century, when it served primarily as an instrument of control over the mass of slaves. Later with the abolition of slavery, in a largely rural country, the police forces came under strong influence of local large landowners known as ‘colonels’ and the practice was subsequently carried on by many. Other examples of Police brutality include, 21 year-old Jens Arne Orskov Mathiason who died while in police custody and on the way to prison. The incident raised concerns over the behaviour of the officers involved, the thoroughness of the subsequent investigation and the willingness of the Director of Public Prosecutions’ to hold the officers accountable for their alleged failings. As a result, Amnesty International has called for the establishment of new mechanisms to investigate human rights violations and to enforce compliance with obligations under the European Convention on Human Rights. In 2016, another man died in police custody after being arrested by seven officers from the Copenhagen Police. In August 2009, police in Copenhagen were heavily criticised for their response to an attempt to dislodge Iraqi refugees who were living in a city church.Amateur video allegedly showed the police using violence against the refugees and their supporters. Between 12,000 and 20,000 people subsequently protested against these actions. In 2012, the Danish Court of Appeal held that the Danish Police had violated Article 3 (against abusive treatment and torture) and Articles 5, 10 and 11 (dealing with the right to liberty, the right to information about the accusation and the freedom of peaceful assembly) of the European Convention of Human Rights, when, in 2009, they had made mass arrests during protests at the 2009 United Nations Climate Change Conference in Copenhagen. In April 2016, video emerged of officers hitting people with batons and violently detaining a man, despite onlookers saying he couldn’t breathe. The International Day against Police Brutality first began in 1997 as an initiative of the Montreal based Collective Opposed to Police Brutality and the Black Flag group in Switzerland. Acceptance of March 15 as a focal day of solidarity against police brutality varies from one place to another. In the United States, the October 22 Coalition to Stop Police Brutality, Repression, and the Criminalization of a Generation, a group mounted by the RCP, has succeeded in building support for October 22 (also known as O22) as National Anti Police Brutality Day since 1995. World Consumer Rights Day is held annually on 15 March to promote the basic rights of Consumers and to make sure those rights are respected and protected and to protest against market abuses and social injustices which undermine them. The organisation was first established in 1960 as the International Organisation of Consumers Unions (IOCU) by national consumer organisations. The original members recognised that they could build upon their individual strengths by working across national borders. The organisation then rapidly grew and soon became established as the voice of the international consumer movement on issues such as: product and food standards, health and patients’ rights, the environment and sustainable consumption, and the regulation of international trade and public utilities. The founding of IOCU was initially planned by Elizabeth Schadee, who would later chair the board of Holland’s Consumentenbond, and Caspar Brook, who was the first director of the England’s Consumers’ Association. The two proposed an international conference to make plans that consumer product testing organizations worldwide should work more closely together. The United States organization Consumers Union provided US$10,000 at the direction of Colston Warne to help fund the event. In January 1960, these three organizations sponsored the First International Conference on Consumer Testing in The Hague. Thirty-four people representing seventeen consumer organizations in fourteen countries attended to discuss product testing and founding the International Organization of Consumers Unions as an international organization. Belgium’s Association des Consommateurs and the Australian Consumers’ Association joined the three conference sponsors as the five founding organizations who would provide representatives for the international organizations initial council. Michaels, Rockett, Dall, and DeVille released Their debut album, Look What the Cat Dragged In, August 2, 1986. Including the songs, “Cry Tough”; “Talk Dirty to Me”, “I Want Action”, and “I Won’t Forget You. Poison’s second album, Open Up and Say…Ahh!, was released in 1988 and included the songs “Every Rose Has Its Thorn”, “Nothin’ but a Good Time”, “Fallen Angel”, and “Your Mama Don’t Dance”. 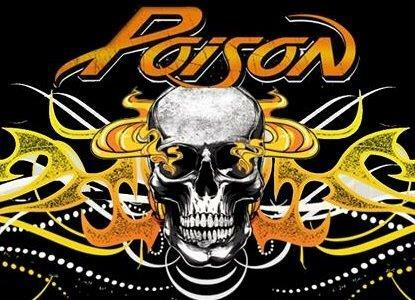 Poison sold over 50 million records worldwide and has sold 15 million records in the United States alone. The band has also charted ten singles to the Top 40 of the Billboard Hot 100, including six Top 10 singles and the Hot 100 number-one, “Every Rose Has Its Thorn”. Poison released their third consecutive multi-platinum selling album, Flesh & Blood in 1990 containing the singles: “Unskinny Bop”, “Ride the Wind”, Life Goes On”,”Flesh & Blood (Sacrifice)”and the ballad “Something To Believe In” which was dedicated to the band’s security guard and close friend James Kimo Maano who had recently died. ” In the 1990s following the release of the band’s first live album, Swallow This Live, the band experienced some line up changes and the fall of pop metal with the grunge movement, but despite a drop in popularity the band’s fourth studio album, Native Tongue, still achieved Gold status and the band’s first compilation album, Poison’s Greatest Hits: 1986–1996, went double platinum. In the 2000s, with the original line up back together, the band found new popularity after a successful greatest hits reunion tour in 1999. The band began the new decade with the release of the long-awaited Crack a Smile… and More!, followed by the Power to the People album. The band toured almost every year to sold out stadiums and arenas. They released a brand new album, Hollyweird, in 2002 and in 2006 the band celebrated their 20-year anniversary with The Best of Poison: 20 Years of Rock tour and album, which was certified Gold and marked Poison’s return to the Billboard top 20 charts for the first time since 1993. Since their debut in 1986, they have released seven studio albums, four live albums, five compilation albums, and have issued 28 singles to radio. Brett has released several solo recordings including the soundtrack album to the movie A Letter from Death Row, Songs of Life, in 2003. Michaels has also appeared in several movies and TV shows, including as a judge on the talent show Nashville Star. He starred in the hit VH1 reality show Rock of Love with Bret Michaels and its sequels, then released Rock My World. In 2006, Hit Parader ranked Michaels at #1 on their list of greatest Heavy metal singers of all-time. After 25 years, Poison are still recording music and performing. In 2012 VH1 ranked them at #1 on their list of the “Top 5 Hair Bands of the ’80s”. They have sold over 50 million records worldwide and 15 million records in the United States alone. The band has also charted ten singles to the Top 40 of the Billboard Hot 100, including six Top 10 singles and a number-one single, “Every Rose Has Its Thorn”. Infortunately the band’s new found fame and success caused numerous problems. Relationships within the band were deteriorated particular between the Stone brothers & Bass player Larry Graham. After moving to the Los Angeles area in 1969, Stone and his bandmates became heavy users of illegal drugs, As the members became increasingly focused on drug use and partying (Stone carried a violin case filled with illegal drugs wherever he went), recording slowed significantly. Between summer 1969 and fall 1971, the band released only one single, which was one of the first recordings to employ the heavy, funky beats that would be featured in the funk music of the following decade. It showcased Graham’s innovative percussive playing technique of bass “slapping”. During this time Stone’s behavior became increasingly erratic. new material was anticipated in 1970, but with none forthcoming, a Greatest Hits album was released that November. One year later, the band’s fifth album, There’s a Riot Goin’ On, was released. Riot featured a much darker sound as most tracks were recorded with overdubbing as opposed to The Family Stone all playing at the same time as they had done previously. Stone played most of the parts himself and performed more of the lead vocals than usual. It was also the first major label album to feature a drum machine. The band’s cohesion slowly began to erode, and its sales and popularity began to decline as well. 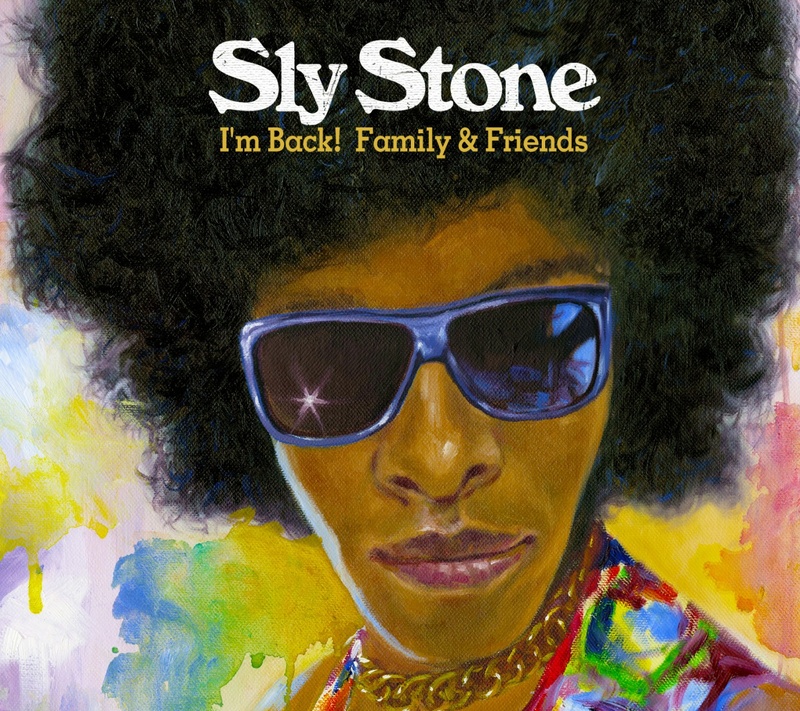 Live bookings for Sly & the Family Stone had also steadily dropped since 1970. The final straw came In January 1975, after the band booked itself at Radio City Music Hall. The famed music hall was only one-eighth occupied, and Stone and company had to scrape together money to return home, Following the Radio City engagement, the band split. Mike Love, American singer/songwriter and musician with The Beach Boys was born March 15th in 1941. He was a founding member of the beach Boys along with his cousins Brian, Carl, and Dennis Wilson, and their friend Al Jardine. From an early age The Wilson family home was a musical one, and Mike often sang with the Wilson family at get-togethers at the Wilson home during his childhood. Brian and his brothers Carl and Dennis Wilson along with Mike Love and Al Jardine first gelled as a music group in the summer of 1961, initially named the Pendletones. Brian Wilson also began to experiment with recording songs after receiving a Wollensak tape recorder on his 16th birthday, which lead to the Formation of The Beach Boys, and After being encourageded by Dennis to write a song about the local water sports craze, Brian and Mike Love together created what would become the first single for the band, “Surfin’”. and sang the lead vocal on many of the Beach Boys’ biggest hits, mainly fast-paced rock’n’rollers (while Brian Wilson handled the early ballads), including “Surfin’ Safari”, “Surfin’ USA“, “Shut Down”, “Little Deuce Coupe“, “Be True to Your School”, “Little Saint Nick”, “Fun, Fun, Fun“, “I Get Around”, “When I Grow Up (To Be a Man)”, “Little Honda”, “Dance, Dance, Dance” and “California Girls“. The Beach boys latest album was the career spanning retrospective “That’s why god made the Radio”. Love continues to perform with the band to the present day and was inducted into the Rock and Roll Hall of Fame in 1988 along with the other founding Beach Boy members.